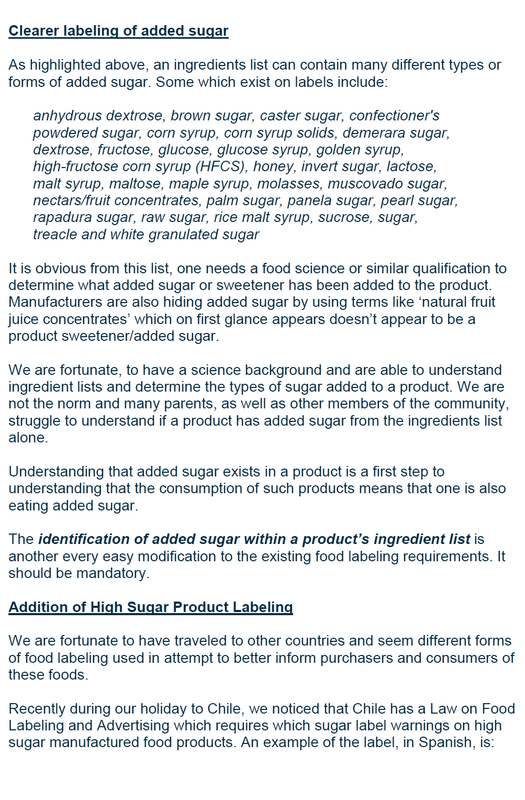 Want to see improved sugar labelling? 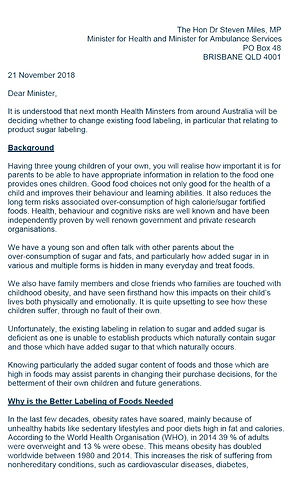 On December 7, Health Ministers from across Australia will be meeting to discuss 7 potential options for sugar labelling on food and drink products. The problem is that sensible label solutions are being considered alongside the status quo or worse still, digital labels, which won’t help you identify the amount of sugar in a product. To make sure Ministers vote for improved sugar labelling, we’re asking if people can send a handwritten letter to their Health Minister. A personal message goes a long way and will help capture our leaders’ attention on this issue. We’ve made it as easy as possible Head to www.choice.com.au/addedsugar for instructions. 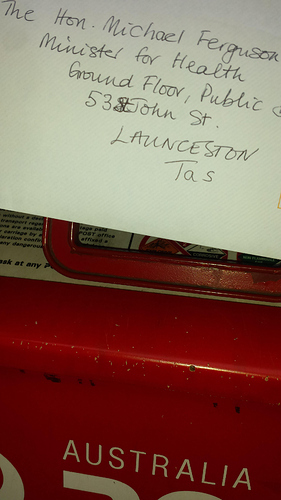 You can write your own letter or request a letter pack and we’ll send you everything you need. Greatly appreciate any involvement, thank you! Supporters are already sending their letters! Requested letter pack . Posted to Facebook for others to get involved . Done likewise and will share with family/friends when it arrives…hoping they also join the campaign. I fully endorse the first 4 people choice actions being implemented as a minimum. 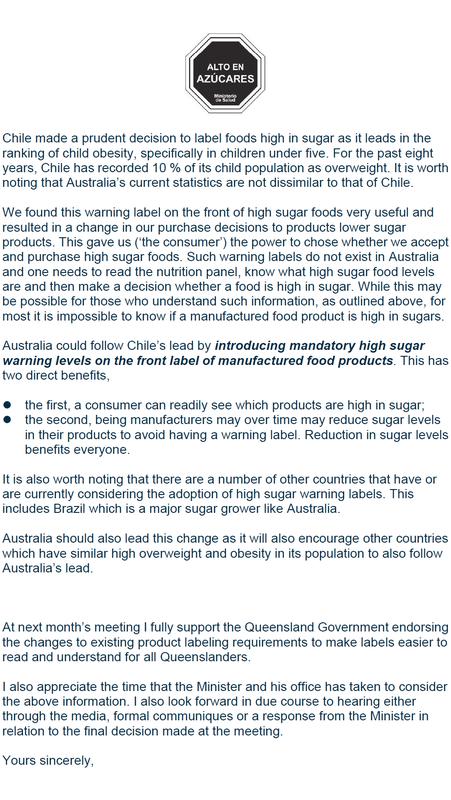 I see Choice only supports the top 3, but having seen warning labels on the front of packaging used on high sugar products in other countries, warnings being prominent makes one think twice about the purchase of such products. 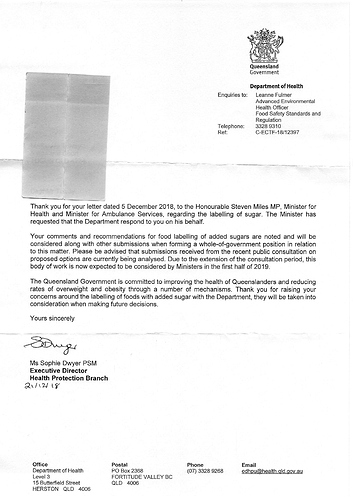 In our formal submission to the added sugar consultation we supported both visual displays of teaspoons of sugar and warning labels as effective tools to communicate to consumers. We said that a decision needed to be made based on what the most effective method would be. When we surveyed consumers, most people supported visual teaspoons of sugar which is why we have more strongly focused on this option. Thanks again for getting involved! Tagging our @Defender-Black group in case anyone wants to get involved with this action. Feel free to send through a picture if you choose! 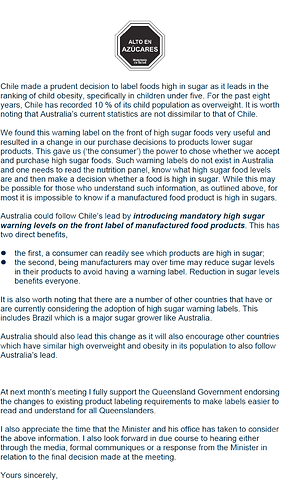 I have also included the High Sugar Warning label measure as have directly seen its use and value. This is something I personally believe has merit. I have also done the Aussie Dictionary Check to remove any Americanisms. Here is a lighthearted look at the amount of sugar in foods. The number of teaspoons is demonstrated and emphasised. Note: One must register with SBS On-demand to view this video. Received letter pack 26-11-2018 . Posted to health minister the following day . Thank you for your correspondence to the Minister for Health and Minister for Ambulance Services, the Honourable Steven Miles regarding the labelling of sugar. The Minister has requested that the Department respond to you on his behalf. Please be advised that the submissions received from the recent public consultation on proposed options are currently being analysed. Due to the extension of the consultation period, this body of work is now expected to be considered by Ministers in the first half of 2019. 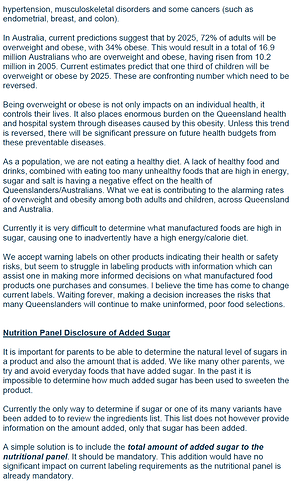 Please be advised that the Queensland Government is committed to improving the health of Queenslanders and reducing rates of overweight and obesity. Thank you for raising your concerns with the Department, they will be taken into consideration when making future decisions. A somewhat non-committal and typical response from government. It is worth noting that the like date for State Ministers to address the issue is not in the first half of 2019. I understand that this month there will be a meeting of Health Ministers on the labelling requirements for sugars in food and drinks. In recent times research has increasingly shown the significance of sugar’s detrimental effect on health. Despite our best efforts explaining this to our son, using two spoonfuls, or three, or even four of drinking chocolate in his glass of milk is not unhealthy because he doesn’t understand from the labelling how much sugar he is consuming. It needs to be clear and understandable so even children can see and understand what they are consuming. To me, the current situation with sugar is reminiscent of the tobacco industry’s fight years ago to deny and suppress the existence of any detrimental effects of their product. Isn’t it better to look at the science showing how damaging sugar can be to your constituents, instead of listening to food industry lobbyists who want to deny there is any problem with their products and place the blame onto consumers; just as the tobacco lobby did. 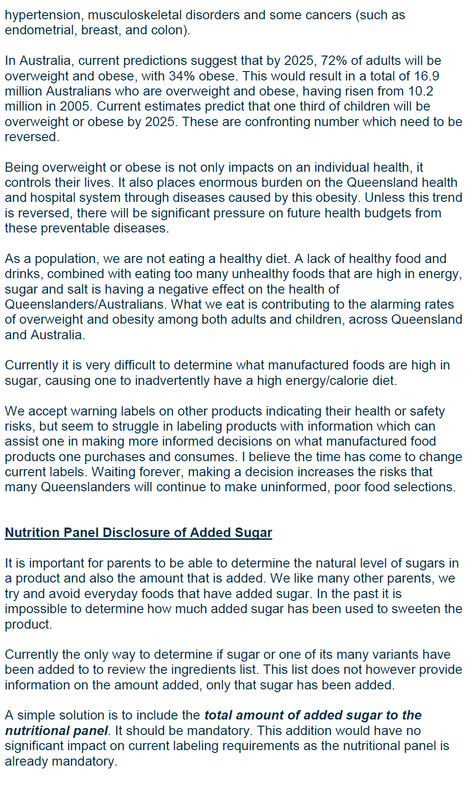 •	Health warnings on foods with excessive sugars. 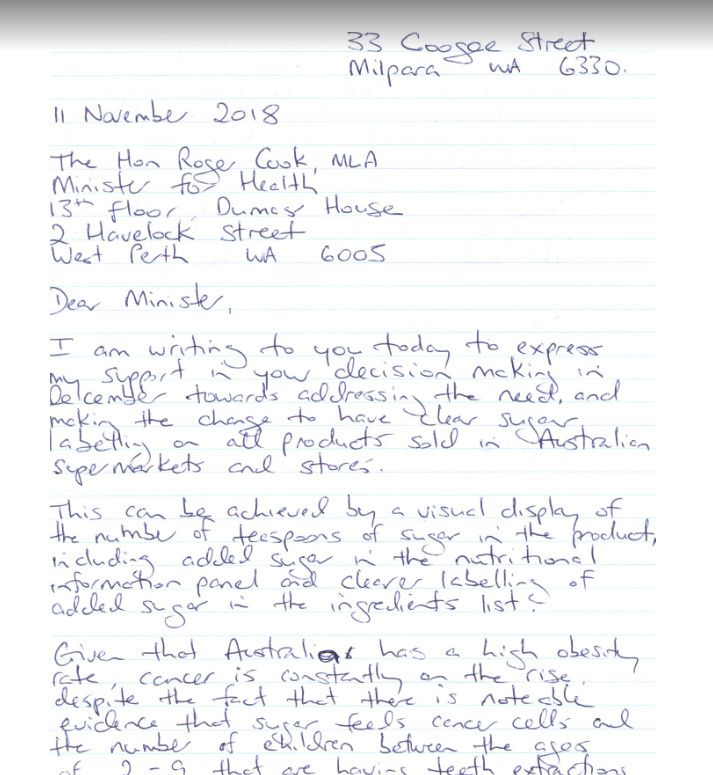 In your role as my Minister for HEALTH, I hope you make the right choice based on the science and place the health of Australians first and foremost. I look forward to hearing the outcome of your meeting with the other Ministers. 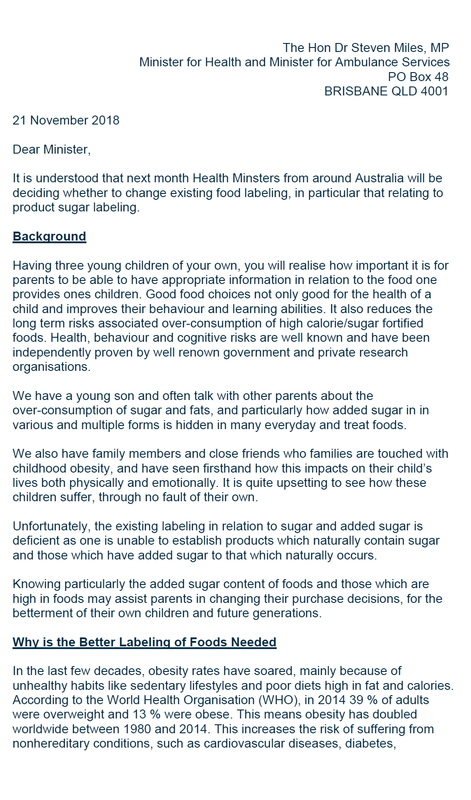 We do not want our boy to be able to make informed choices on how much sugar he has in his diet. Good pick up. Edited bits out and didn’t notice. 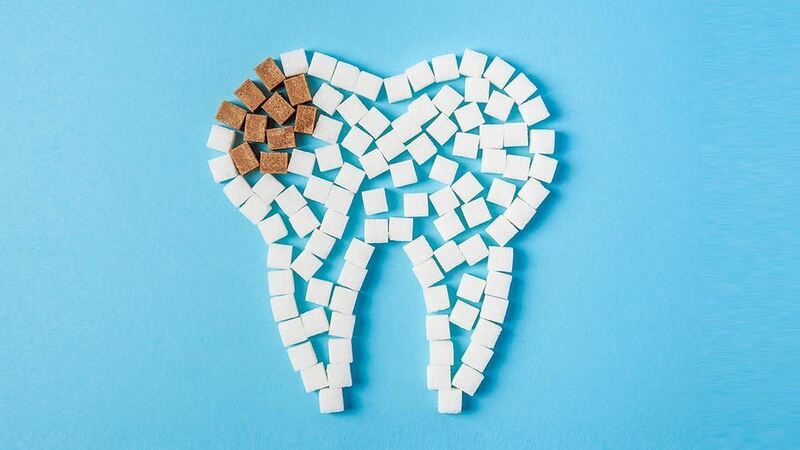 Dental public health expert Matthew Hopcraft says Australians are consuming too much sugar and it's time to do something about it. 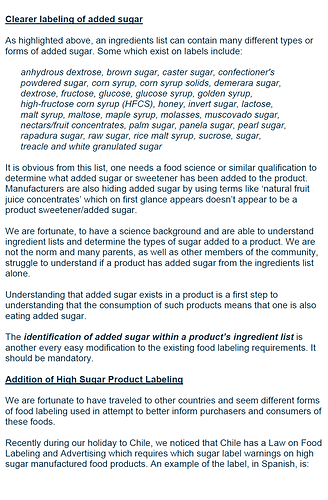 Absolutely, I support full disclosure of sugar contents and take out the chemical jargon names masses don’t understand (I am told there are 57 various names for simply “sugar”). Labelling is only the beginning, a lot more needs to be done to reign in this epidemic.Education is required at every stage in life and primarily mothers of young children as bad habits are learnt at early age.